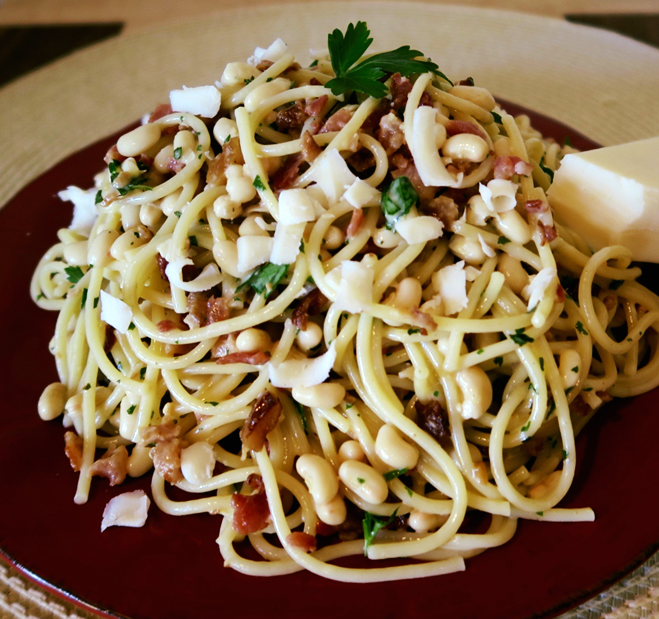 This different take on spaghetti is both delicious and nutritious. 1. Fry bacon for 1-2 minutes then add garlic; cook another minute or two. 2. Boil spaghetti according to box directions; drain and return to pot. 3. Beat egg with cream, black pepper and red pepper flakes; pour over noodles while they are still hot and stir quickly so the spaghetti can “cook” the eggs. 4. Stir in peas, parsley, cheese and bacon-garlic mixture. 5. Serve with crusty bread and butter. for the White Acre Peas.